If you look hard enough, anything can be found. 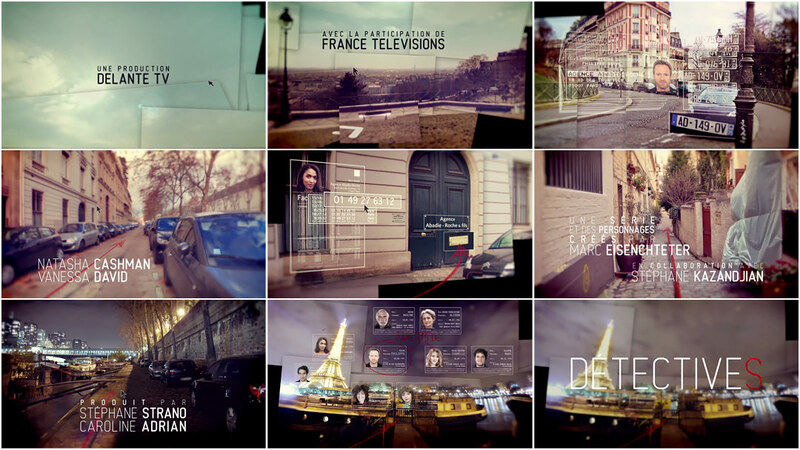 For the French TV series Détectives, REANIMATION visualizes modern investigative techniques through a fast and fun first-person approach. Your television set is a computer monitor and you’re the sleuth. You find yourself on a ride through les rues de Paris via a Google Streetview-style interface, information flying toward you so fast that it’s beyond the grasp of a single viewing. Images of the city are pieced together to create a bigger picture while clues are uncovered at a pace that would make Sherlock Holmes dizzy. This marriage of the digital space with the physical world sidesteps the tired trope of characters transfixed by a computer screen. Every clue you uncover leads to another member of the Roche family, and thus the characters of Détectives are introduced while establishing a playful and interactive tone for the series. Creative Director YANN DEVAL of REANIMATION details the creation of the title sequence for us. Détectives is a television show that aired on the channel France 2 in spring 2013. 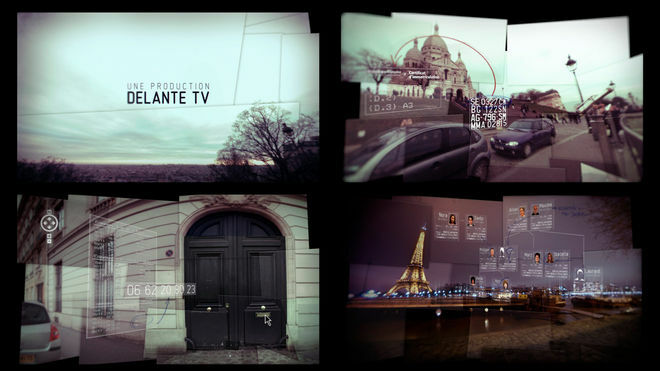 Delante TV got in contact with us early in the project – during the writing of season one – for the design of the opening credits. We had collaborated with Delante before on the feature film Moi, Michel G (2011). The brief was simple: Create a 40-second sequence to set up the series’ universe and include the city of Paris, modern investigation techniques, and an introduction to the Détectives characters. The general mood had to evoke the fresh, light, and modern feel of the series. We were given the scenarios of the first two episodes so that we could immerse ourselves. The viewer follows a small investigation through Paris, jumping from one clue to another via a Google Streetview-like interface. At first you don’t understand what the clues are leading to, but as you continue to move through the city, you realize that the object of the investigation is the Roche family. 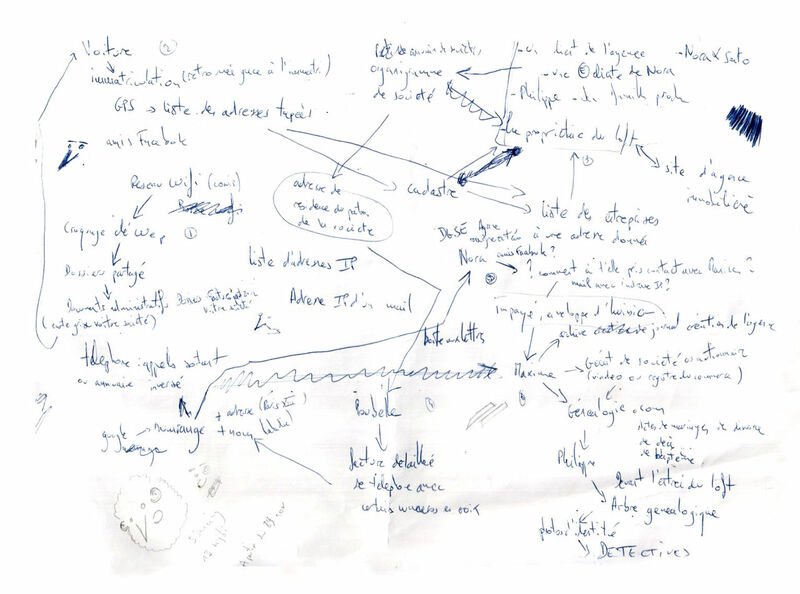 First draft of our research into the links between the clues of an investigation. The goal for the opening sequence was to get the audience to want to watch the sequence repeatedly. Ideally, they would notice new details at the beginning of every episode. The investigation is fluid as one clue leads to another; the eye is constantly guided by a common thread which drives you elsewhere (a pen stroke, a mouse cursor, etc.). The investigation has a playful aspect that helps set the tone for the light atmosphere of the series, far from the dramatic or shabby clichés other police TV series can have. In this sequence, we wanted to show the tools that a modern detective uses on a daily basis. These mainly consist of the clever use of things we all have access to: search engines, databases, social networks, and so on. We intensely researched in order to create a credible investigation for the title sequence, drawing upon things like detective’s testimonies and specialized books. After researching and scouting potential shooting locations in Paris, we came up with our storyboards and first designs. In order to create animated street views, we needed a very special capture technique which would allow us to create 360° stop-motion sequences. We started to look for a camera that could take a 360° picture in a single shot. 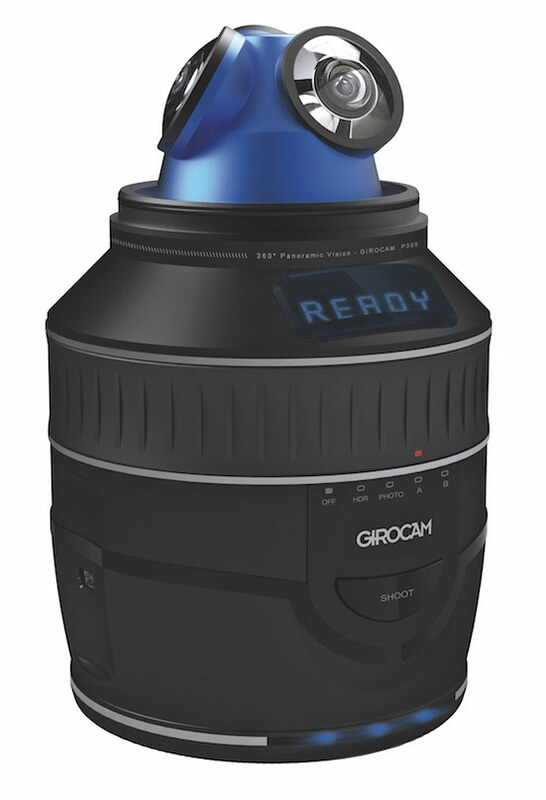 In 360° HDR mode, the Girocam needs two minutes to take and render a single frame. 82 frames were used for the introduction shot alone, which meant about two hours and thirty minutes of actual shooting were required to record just that scene. In post-production we were then able to move inside these timelapses, changing the camera movements. It took us many tries to get satisfying shots with the 360° timelapses. We faced issues with picture resolution, color difference, our lenses, shaky footage, people moving their cars at the wrong time, not to mention the weather. We actually had to completely re-shoot the opening shot because the sky was too cloudy! These shooting constraints allowed us to be completely free afterwards in post-production with things like editing and camera movements. We also wanted to use another technique for the sequence: photographic travellings, a process which gives us a way to smoothly move through the city. We like to use it on a regular basis. The choice of the track “When You Know” was part of the brief from the very start. Puggy is a Belgian band and many of their songs are used in Détectives episodes. Re-cutting the audio for the sequence was particularly complex, and six cuts to the song were required to take it down to a 40-second piece that still maintained the original structure. The band was quite familiar to us as I'd worked on the motion graphics for their music video “Dubois” in 2007. 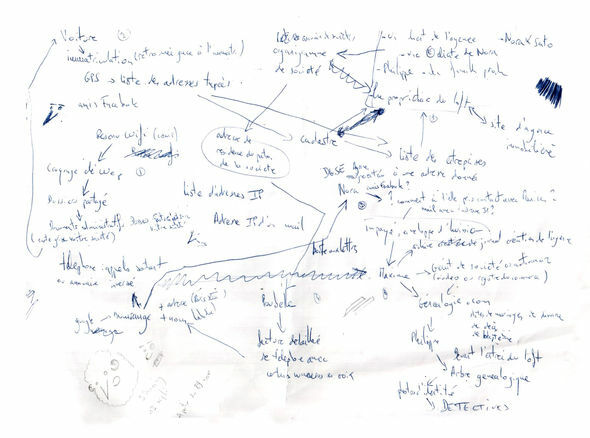 Some of our inspirations include Saul Bass, Michel Gondry, Mike Patton, Studio 4°C, and Darren Aronofsky. Our favorite title sequences are classics like Carnivale, Vertigo, Fight Club, Enter the Void, Tekkonkinkreet, but recently, it's the strange, unofficial titles sequences like Motherless Brooklyn, The Adventures of Tintin, and The Walking Dead that we’ve found the most creative.